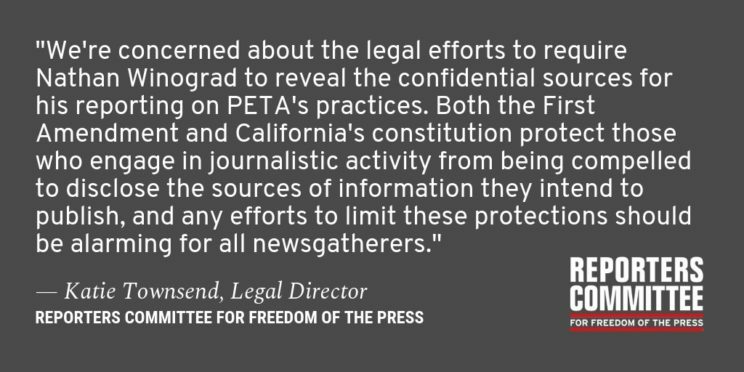 On Dec. 20, PETA filed a motion in California state court to require Nathan Winograd to reveal the identities of his confidential sources who worked at PETA and disclosed information about PETA’s practices. Last week, he filed an opposition invoking his rights under the California Constitution’s shield law & the #FirstAmendment reporter’s privilege, which apply to those engaged in acts of journalism — gathering information from confidential sources with the intent to publish it. RCFP is concerned about efforts to limit these protections in cases like this which involve journalistic activity on the part of individuals who may not be traditional professional journalists.